Did you have a chance to join in on the Crayola Creativitycast last Tuesday night? The topic was Affordable Fun 101. There were some great ideas and tips shared. Some of them took me back to my childhood as people shared about pot holder looms and melting crayon shavings between wax paper. It gave me some great ideas to do with my kids. With back to school just around the corner, Crayola wants to help you get ready with tips and creative ideas to make the back to school season less stressful and more fun! Starting July 28 and every Tuesday night (9 pm Eastern) through the month of August, Crayola is sponsoring "Girls Night Out" on Twitter - the mommy social gathering featuring colorful and engaging discussions on all things back-to-school. Crayola has teamed up with MomItForward.com, the creator of "Girls Night Out" (GNO), to bring you the "Crayola Creativitycast." The weekly Crayola Creativitycast will feature a new topic each week, to help you better prepare your kids for the best back to school ever. Tweet the night away with other moms, Crayola creativity experts, and noted mommy bloggers, and get great ideas to help you prepare for the best back to school ever for your kids! This week's theme will be Back-to-School Basics. Visit http://momitforward.com each Monday for more information and a custom Tweet Grid for that week´s event. On Tuesday nights, starting at 9pm Eastern, tweet using the hashtag #gno and chat away. GNO participants will have the chance to win great prizes. 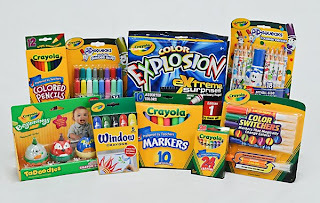 In addition to the prizes that will be awarded during the weekly GNO party on Twitter, I will be hosting a weekly giveaway, following the Crayola GNO on Twitter, I will be giving one Crayola Creativity Pack each week for 4 weeks. That's 4 winners over the next month. Come back here after the Crayola Creativitycast to enter the giveaway. The giveaways will follow the theme of the GNO discussions - check back here for more details. Sound like fun??? Hope to see you Tuesday evening!